Executive Grade I- Max Age 37 years. Executive Grade II- Max Age 41 years. Passed BE/B.Tech/B.Sc Engg Degree in Mechanical Engineering Discipline with minimum 60% Marks and minimum 4-8 year Post Qualification work Experience in Similar Field. 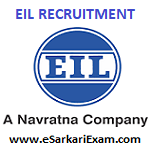 Eligible Candidates can Submit EIL Executives Grade I, II 2019 Online Application at the Official Website of EIL Latest by 16th April 2019. Applicants First Open EIL Official Website. Open Careers Tab and Click on Applying to EIL Link. Click on Current Openings Link. Open Executives Grade I/II Recruitment Advertisement Link. Read Advertisement and Check Eligibility Details. Now Click on Eligible Post Link. Upload Scan Photograph and Signature and Other Required Documents.